Roo loves Barbie. I did, too, when I was her age although way back then Barbie wasn't a feature film star like she is today. The new Barbie movies are actually watchable, even by adult standards. (I must admit that the songs from the Barbie Island Princess DVD go through my head all the time…) So when Mom Central gave us the opportunity to review the new Barbie & The Diamond Castle movie, we were both excited. 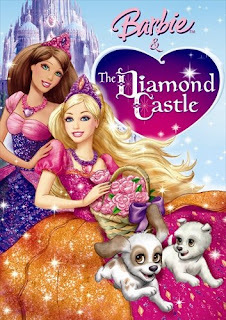 Barbie & The Diamond Castle tells the story of two best friends, Alexa and Liana who are played by Teresa and Barbie. They go on a journey to help Melody, a girl locked inside of an enchanted mirror. Along the way, they adopt cute puppies (Sparkles and Lily– Roo's favorite part!) and meet a Ian and Jeremy, a pair of wisecracking twin musicians. They must all work together, using their friendship and their love of music to find the Diamond Castle and save Melody. The villains are Slyder, a bumbling dragon, and his owner Lydia, a former muse with a magical flute that casts a wicked spell. Barbie & The Diamond Castle might not be breaking any new narrative ground, but it is thoroughly enjoyable. And, as usual, the accompanying toys are already in high demand, at least in our household! Check out the full line of movie-related dolls and playsets along with "bloopers" from the movie and interactive games on the Barbie & The Diamond Castle website.